At Soul Foods we believe that by making small, every day choices we can create a ripple effect of positive change in the world. Soul Foods Conscious Grocer is your Riversdale ‘corner store with so much more.’ This mini-grocer provides your basic grocery needs along with a customized bulk food section (in alignment with our zero-waste initiative), herbal apothecary, Kombucha bar, whole foods cafe and a select line of curated health foods. Soul Foods partners with local producers helping to create a stronger local economy. We believe that healthier bodies result in healthier minds creating a healthier society and that the health of our community is a social responsibility. Therefore; we offer a variety of community building events, educational classes, holistic therapies, counselling services and workshops designed to inspire those involved to take their health into their own hands. Located in the heart of Riversdale in Saskatoon, Soul Foods is an ever expanding grocery and community experience! It is our mission to move beyond the label and create true transparency in relationship to our food. It is with this intention that we have created our product sourcing commitments for you! We commit to sourcing local whenever possible - supporting and strengthening our local economy! We focus on products with no hidden ingredients that are made from whole foods & minimally processed. We choose transparency over organic - we move beyond the label and speak directly to the farmers, knowing how your local produce is grown, cared for and transported to you. When choosing non organic we commit to sourcing based on the clean fifteen and dirty dozen guidelines. We invite you to join our zero-waste initiative and BYOJ (bring your own jar) to refill from one of our bulk food offerings. 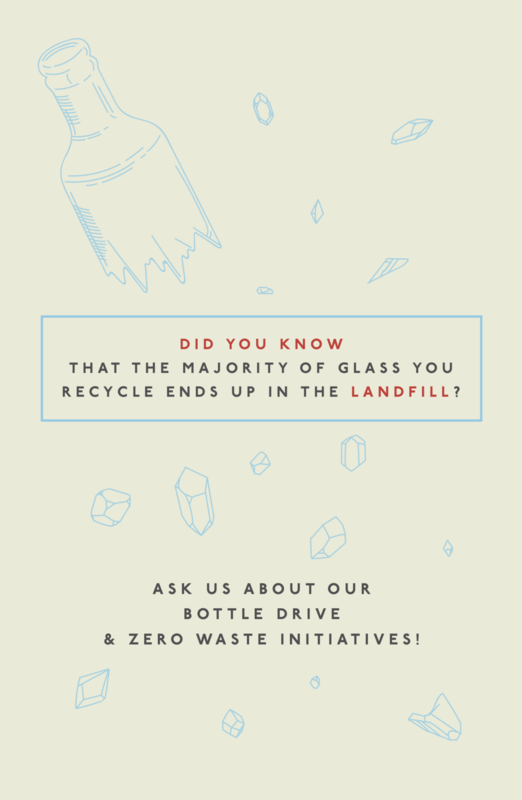 Help us save glass from the landfill! Donate your glass jars for us to re-purpose, with your donations it is our goal to go 100% plastic free! In order to better serve our clients in and around Saskatoon, we are expanding into the food delivery and pre-order service sections with an online store coming soon! We understand that the building blocks of our body come from the foods that we eat and believe that food is a pathway of connection to our body, our mind and our community. We have created each cafe menu item with this in mind using traditional food preparation and preservation methods to bring you the most easy to digest, gut health promoting, deeply nourishing foods. We are proud to partner with Happy Belly Kombucha offering 4 flavours of kombucha always on tap! Visit us in store to try our current flavours and learn more about the world of fermented foods. Join our Soul-cial Initiatives today! We believe that the health of our community is a social responsibility. We have created three core Soul-coal Initiatives with an intention to offer support and services to elevate awareness, increase opportunity and bridge the gap between those in need and accessible, affordable and deeply nourishing foods and holistic therapies. Each and every Sunday we offer 20% off fresh produce, dairy and grab’n’go items. The last Sunday of every month receive 11% off the entire store! Visit us in store to see the daily offerings made available at a ‘pay what you can’ price. Pay what you can offerings are made possible through the very generous donations of our community members. 100% of your donations go directly to this program. We currently offer food based products as a pay what you can option and as this initiative grows we plan to expand into workshops and holistic therapies at a pay what you can price as well. Shift Intuit Is a personal development company that offers intuitive counselling by counsellors that are certified claimable and operating under governing bodies. We work from a holistic framework and view the person as a physical mental emotional and spiritual being. For more information on Shift Intuit counselling services or to book an appointment click HERE! Naturally Amped Foods, Bodycare, and Studio Gym were conceived with the idea that when we take care of our body we have a powerful tool at our disposal. A tool that can help us live a beautiful life of strength and purpose. For more information or to book an appointment click HERE! Mallory Dawn, Psychosomatic Therapist and RYT500 combines her passion for Psychosomatic Therapy and Trauma Informed Yoga through Authentic Empowerment , a personal development company that offers workshops, group sessions and one on one consulting services. Are you an alternative health care practitioner looking for a treatment room or space to host a meeting, workshop or event? Are you looking to launch a food based business or in need of commercial kitchen space? Our commercial kitchen was designed with a community focus enabling us to partner with other local start-ups acting as a launch pad for health conscious food based businesses in Saskatoon. Our kitchen and retail floor was designed to be a multi-purpose space serving as a retail space, production facility and also as an educational space for classes and community building events. We have two beautiful practitioner rooms available to share with you as well! Our dream is to build a team of practitioners, offering a diverse selection of therapies to better serve those in need. We are happy to share our space with you! Contact us at hello@soulfoodsgrocer.ca for more information or to book a viewing. For space rental bookings click HERE! for approved practitioners only please.